Rayon floss is a divisible, six-strand 100% rayon thread. 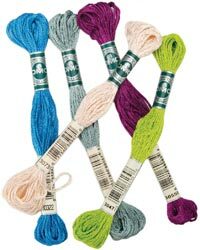 All 100 colors are numbered for easy cross-reference to DMC's embroidery floss color numbering system. This shiny, lustrous thread can be used by experienced cross-stitchers and embroiderers for basic and advanced stitches, particularly when used as an accent to other threads like DMC embroidery floss and flower thread. Colorfast, washable and dry-cleanable.